I’ve never seen clients stand around a written report gesturing at various pages discussing their implications… but when this happens with a drawing, I really feel like my job is done. A written report can be restrictive when working with rich, emotive material, so I often use visuals to communicate insights and what they mean to my clients. The same drawings I use to help myself ‘see the wood for the trees’ can be a valuable tool for sharing findings and concepts. Polished visuals can extend beyond initial graphic impact to tell stories, build context, explain relationships and show processes. Until now I’ve used these as part of a final deliverable as they can be absorbed in a fraction of the time it takes to read a report, are well circulated and fantastic for getting buy in. 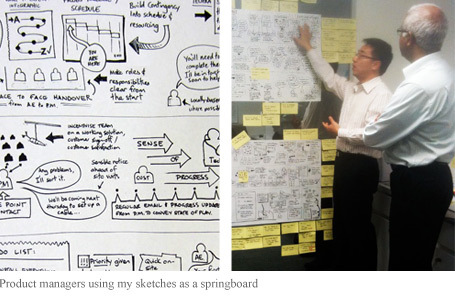 …more recently I’m using sketches earlier in a project as a different kind of tool – a platform for discussion. Although clients don’t always consider it up-front, consensus building can be a valuable outcome from customer research. Teams across design, product, marketing etc. often need to just ‘get on the same page’. Bringing the voice of the customer, or insights from their behaviour alive with a simple cartoon and can really get people talking. A polished deliverable always has it’s place but the pencil is getting a workout earlier in the process these days. I’ve realised different stages of a project require different styles of visual and by using the appropriate level of detail for the audience and the decisions they face at the time, they can be one of the most powerful tools in the box. By popular demand I’ve put a few more examples on the ‘approach’ page of my design research consulting website. … and there’s a link there to request a fuller set. I couldn’t agree more. Everyone standing around an image allows people to absorb it in a non-linear way. There’s also some research shows that we absorb and retain information more efficiently using images. They also look good, which encourages teams to stick the poster up, rather than have a powerpoint archived in darkness. Don’t be worried if you can’t draw. Do something simple and if it’s conceptually correct pay someone who can do it justice. It is refreshing to see someone challenging the status quo – get rid of the report – what a fantastic idea! I feel there are far more efficient and engaging ways to communicate ethnographic research than with a report, particularly when the objective is to reach a mutual agreement amongst the stakeholders on what the project objectives are (THE BRIEF). If read, a text document will be digested in isolation – no discussion amongst the stakeholders or consensus on direction likely. Clients need your help to interpret the research and draw conclusions from it. Here your listening, empathy, re articulation and reinterpretation of their problem is imperative. A text document is not able to listen, or engage in such a discussion. 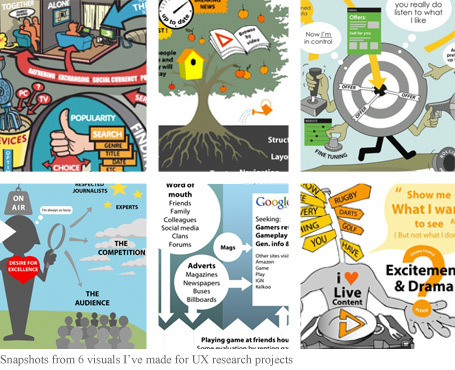 Your visuals evidently allow you present your research in such a way that it can be quickly digested by the stakeholders. Unlike the text document you can be interactive and respond to their feedback. With your facilitation I’m positive you will have a higher likelihood of obtaining consensus.